Although this example shows the installation of the Ubuntu Linux distribution, installing most other Linux distributions is a similar process. I have chosen Ubuntu as it is a friendly, free, highly compatible distribution of Linux and at the point of writing, it has been one of the most popular Linux distributions for quite some time. This example shows how to install Ubuntu alongside Windows. You can also select an option to just install Ubuntu on its own (shown later). Please also note that this tutorial details the installation of Ubuntu Linux on a PC, if you have a Mac, the instructions same. In particular, the tools you will use for partitioning your hard drive may be different. Step 1: Getting your PC to start from USB/CD. If you remember back in Chapter 4 we discussed partitioning your hard disk. If you didn’t read that part, to have a fuller understanding about what we’re about to do with your hard disk, skip back and read it now. At this early point in the process of installation, be aware that you will be working with your hard disk in order to install Linux. You MUST make a backup of that data before starting. You do all of this at your own risk! The main step with a Linux installation is to virtually ‘slice’ up your hard disk into partitions in order to put Linux onto it. This process is called partitioning. You will not have to perform this step if you have chosen to use an additional new or recycled hard drive to install linux onto. Also, if you wish to simply delete the operating system (Windows/Mac OS) clean off your computer, then this step is also not necessary, otherwise, proceed forward!. Since as far back as 2007, it has been possible to re-partition your disk drive during the Linux installation process. This makes it far easier to do, so this guide has been updated to follow this process. For those of you that prefer a visual demonstration of how to install Linux alongside Windows, there is a video at the end of this guide. If you still want to partition your hard drive before installing Linux, for example if you want completely granular control of how you split up your disk partitions, even after you have installed Linux, then you can use a tool like GParted, or these others to partition your disk so that you can create some free space to put Linux onto. A PC with at least 2GB RAM, 40 GB free space on your C: drive or target install drive. If that all checks out, then you are going to need a copy of Ubuntu Desktop edition. Head on over to their website (https://www.ubuntu.com/download/desktop). Download a copy. When it’s downloaded, you’ll end up with a .iso file. This file type is what is known as a disc image. Click on this animation to see how to download the Ubuntu disc image from their website. If you prefer to use a DVD-R, rather than a USB stick, then skip this section and see the one below. There are a few ways to put an ISO image onto a USB stick these days and it’s a lot easier than it used to be. 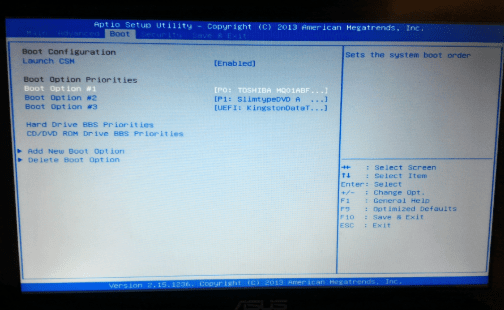 As most of us have USB sticks lying around the house, this is now the most common way to install a Linux distribution. The easiest way to put the ISO image you downloaded onto a USB stick is to use a free tool called Etcher. Head over to their website (https://www.balena.io/etcher) and download the tool. If for whatever reason you have troubles with the BalenaEtcher tool, you can alternatively use a tool called Rufus if you are using Windows. Read this short guide. Once you have downloaded BalenaEtcher, open the app and insert your USB stick into your computer. Using Etcher is as simple as one, two, three! As you can see from the above image, the rest is a piece of cake. Click on ‘Select Image’ and point it to the ISO file you just downloaded. If you have already inserted your USB stick, it should already show up in the middle. Finally, just click Flash (your PC may ask you for authorisation to do this). This ‘flashing’ process takes around five minutes. No nudes were involved in this flashing process! If you prefer to use a DVD rather than a USB stick then you are in luck, burning an ISO disk image to a DVD is easy these days if you have Windows 7 or later, then simply right click on the icon of the file you just downloaded, which will be named something like ubuntu-18-10-desktop-amd64.iso. Once you right click the icon, you will see the option ‘Burn disc image’. Select that option and pop a blank DVD-R or into your PC and click burn. If you would like further instructions on this process or are using an older Windows or other operating system, check out this easy guide at the Ubuntu web site. Note for mac users: If you are using a Mac computer, note that all of these steps will be completely different so you should follow our guide on installing on a mac computer. Hopefully you are now armed with a Linux DVD or USB stick that’s good to go. If the DVD was ejected from the CD player, pop it back in the drive and Restart your computer. Most PCs will automatically try to start the computer from the CD drive or USB, so hopefully you will be presented with a Ubuntu welcome screen after a minute or so. Often when you start a PC you will see the logo of the manufacturer flash up briefly before it starts up Windows. You may see a message like ‘Press F12 for Boot Options’. If you don’t see any message like that, try pressing ESC or F2 whilst the logo screen is up. This may reveal which key you need to press. You may have to stop and restart your computer a number of times to do this as the logo disappears pretty quickly! 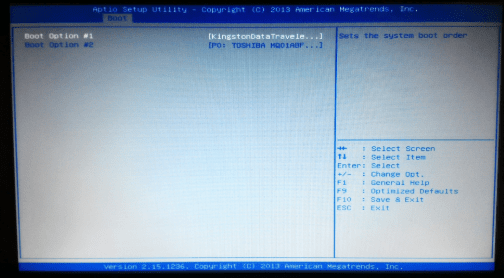 If you don’t see anything like ‘Boot Options’ but you see something like ‘Press F2 For Setup’ then hit that key and enter the BIOS setup utility. In there, have a look around the menus using the arrow keys. You should be able to change the boot order to something like CD/DVD or External USB Media first (as opposed to hard drive first). Save the settings from there and then restart once again. 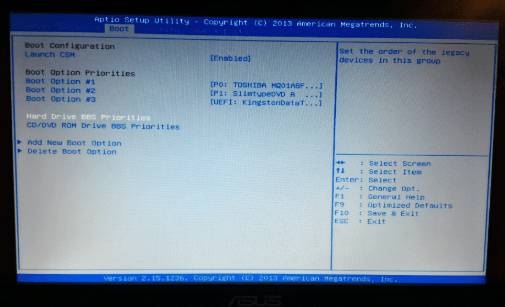 The below images shows a typical ‘BIOS’ Setup screen. It shows the process involved in making sure USB (or CD) is the primary boot option, hard drive secondary. This next part of the guide steps you through installing Ubuntu alongside Windows. Once you’ve started up Ubuntu from the USB stick or CD, the first thing you will see is an option to Try Ubuntu or Install Ubuntu. Select your language from the left hand side and click on Install Ubuntu. Next select your keyboard layout and language. Press Continue. You’ll be asked to choose which installation type you want. The default is ‘Normal installation’. Leave that as-is. You’ll see Other options also. Two tickboxes; one for ‘Download Updates whilst installing Ubuntu’ and the other ‘Install third-party software for graphics and Wi-Fi hardware and additional media formats’. Make sure both of these are ticked, as per the image below. This step is the most tricky. Hint, it’s not really tricky at all! For this example, I have Windows 10 on this PC. For whatever reason, I’d like to keep that and install Ubuntu alongside it. This is the easiest option to choose if you want to keep Windows because the Ubuntu installer takes all the pain out of partitioning your hard drive. Alternatively, you can choose to ‘Erase disk and install Ubuntu’. If you select this option then Windows will be no more. If you’ve got a system that you’re done with and you want to start with a blank slate, then this option is for you. This option is the easiest of them all. Finally there is another option called ‘Something else’. We won’t go into this one for this guide, however this allows you to manually create partitions in the way you want them to be. I’ve selected ‘Install Ubuntu alongside Windows 10’. I have clicked Continue. The next screen allows you to resize your Windows Partition (ntfs) to the size you want, freeing up enough space for Ubuntu. Have a look at the below screenshots. 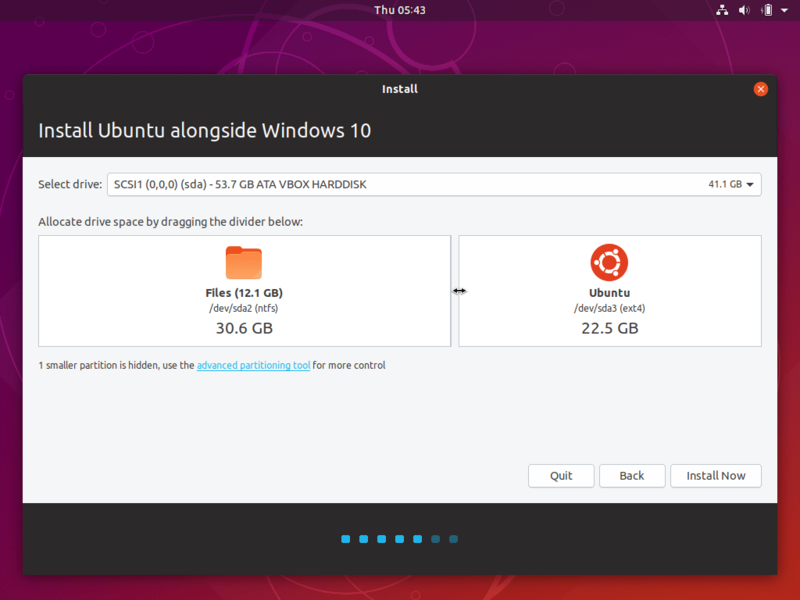 You can see that by default the Ubuntu installer has decided to give most of the space (30.6GB to Windows). It set 22.5GB to give to Ubuntu. I decided that this was a bit miserly, so I slid the size of the Ubuntu partition to the left, so it was equal in size to the Windows partition. Below you can see the before and after screenshots. Once you are happy with the sizes, Press ‘Install Now‘. Next, you’ll be asked to confirm that you want to make the changes to the disk. Press Continue to both. The next few items are all fairly self explanatory. Choose with location you are in the world so that your time zone and regional settings are appropriate to you. Once you have selected the right one for you, press ‘Continue‘. The final step is to set up a user account and set the name of the computer. In the below screenshot you can see that I’ve put my name as ‘The Ultimate Linux Newbie Guide’. Of course you would enter something like ‘Jane Doe’ in this field. The computer’s name can be whatever you want it to be. When it is seen by other devices on your home network, this the name it will be seen as. The next item is to select a username to use to log in with, etc. Don’t use your full long name here, use something without spaces. For example ‘jdoe’. Note that Ubuntu always sets the first user specified as an administrative user. This means that as you are the first account on the machine, you will get to do privileged tasks. Such tasks for example; install software, update the system and deal directly with hardware. Take this information with a little caution. If you are asked again for your password when doing something in Ubuntu, it is asking you to escalate your own privileges into what Linux calls the ‘root’ user. Root is simply the username of the administrator in Linux. As administrator you have free reign over the system at all times. Do not perform tasks as root unless you know what you are about to do, or unless you have confidence in the task ahead! No, I wasn’t born in 1977, my favourite colour isn’t blue, but my dad did have a Volvo 240GLS! However, you get the idea. The password is still important, especially if you ever run any server or sharing software on your machine in the future. Having a secure password makes sense. Once you are satisfied that you have set a name, username, password and computer name that you are happy with, Press ‘Continue‘. By now, most of the software you will need will have been copied to your hard drive. Your user account will be set up and your regional settings are all ready for you. It’s time to restart the machine. Make sure the USB stick or CD is removed from the drive when prompted and continue onwards! When you start your PC, you’ll see something like the above screen. You can choose whether you want to start up Windows or Linux (Ubuntu). Select the system you want using the arrow keys. When you start up your computer, you will likely see a boot-up screen asking you if you wish to choose Windows or Ubuntu (that is, if you installed Ubuntu alongside Windows). Choose Ubuntu from the list using the cursor keys (the up/down arrow keys) and hit enter and it will start up Ubuntu. The next screen you will see is the Ubuntu login screen. It’s the screen you will see every time you start up Ubuntu. If prompted, select the username that you created earlier (or type it in if required), then enter your password. The system will then log you on. The Ubuntu desktop is a friendly place, which we will cover in the chapters six (How do I use Linux?) and seven (Using Linux Every Day). If you are used to Windows, your ‘Start’ menu is the bar along the left hand side. The bottom button which looks like a bunch of dots allows you to search your computer for Apps. Simply by start typing the app’s name (eg Firefox) or simply by looking at the list of icons for all of your apps. A screenshot of the Ubuntu 18.10 desktop. You’ll note that a few favourite Apps have already been ‘pinned’ to the bar on the left, these include the Firefox web browser, the LibreOffice (free Microsoft Office compatible word, excel, powerpoint suite). You can pin your own favourites to the left-hand side bar if you desire simply by dragging an icon from the Applications list into the bar. On the left-hand side bar there’s a folder icon. Clicking on this will show you all the files on your computer. In most cases, your Ubuntu machine will have been set up to see your Windows file systems by default. Clicking on the folder icon, you’ll see ‘Other Locations’. In here, you can see your Windows drive. Illustrated in the below screenshot. The 27GB Volume is my Windows disk. Clicking on it reveals the ‘C:’ drive, so I can access files like my Photos and Documents from Ubuntu. For those of you who prefer a visual guide, I’ve devised the following video tutorial to walk you through the process of installing Ubuntu Linux on your home PC. It assumes that you already have Microsoft Windows pre-installed, so it shows you how to re-partition your hard disk to put Linux on it. Note that although the version is 14.04 LTS, the steps are practically identical for any modern version of Ubuntu or Linux Mint. 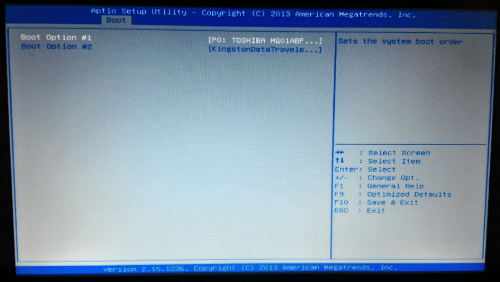 Part 1 of 2 (Guides you how to download and install the Ubuntu 14.04.1 LTS iso image and make it bootable on a USB stick). It uses the Universal Boot Installer, which while is still available, i’d recommend using the above BalenaEtcher tool for ease of use. Now that you’ve seen how to install Linux, get on to chapter six, to see how to use your Linux Desktop! Just installed Ubuntu alongside Windows 10. The install was a breeze, I held my breath as it added the new Linux partition but it worked perfectly. The only issue I had was when I went to boot Windows I received a disk error. Did a restart and tried again with the same error. The third time was a charm when Windows said it would fix the disc problem. It did fix it and now I can boot to either Window or Linux and I’m a happy camper for now. Next is learning what is available and how to use it. I will say this, the interface is very much improved over the last time I played with Linux. I am much happier with the interface now. Thanks for the good work. Thanks Ron, check out the later chapters in the guide for some inspiration on how the Desktop interface works and some of the more popular app choices!